Cooperation between body, mind, and spirit is the key to unlocking our full human potential. These three interdependent elements make up the foundation of a personality. When one element is neglected, the whole organism suffers. Certain types of stories, when held in the mind, can generate physical stress. Likewise, physical stress often leads to the deterioration of mental health. Fortunately, our nervous system has a third, transcendent function; a primordial and sentient awareness that emerges when we bring mind and body to a state of rest. This inner awareness has an intrinsically healing quality that brings the whole organism back into balance through kinetic and bioenergetic reflexes. Mental and physical imbalance is generally caused by a series of traumatic events. Physical trauma is easy enough to understand; a shoulder injury creates a biochemical imprint that continues to appear in that region of the shoulder until treatment is rendered. Emotional trauma is more elusive, beginning in the mind and gradually moving toward physical manifestations like neck pain, migraines, or tightness in the lower back. The symptoms of trauma tend to linger long after the initial source of pain has disappeared. There are many solutions available for the treatment of traumatic injury. Cognitive behavioral therapy is among the most common approaches in the United States. Practitioners attempt to guide their patients toward new ways of thinking about the world through the creation of positive daily routines. This union of emotional and physical re-patterning can help people to relate to life in new ways and return to a high level of social functioning. Despite its positive reputation, cognitive behavioral psychology has also been criticized for its mechanistic and reductive approach to healing the body. A threshold of rehabilitation is often reached, wherever a set of valuable life skills have been learned and put into practice. The patient has what they need to carry on with their life, yet they are not completely healed. Alternative healing modalities can be introduced at this phase to significantly enhance the person’s quality of life. I was recently introduced to a technique called TRE (Traumatic Release Exercise). The experience inspired this article because it provided a direct and powerful solution to physical tension that had been stuck in my body for months. The practice was formulated by Dr. David Berceli. Over the past decade it has spread across the globe to bring aid to people seeking to discharge traumatic stress through a purely physical approach. His organization has a humanitarian slant, aiming to bring low-cost solutions to people living in conditions where more expensive psychotherapeutic approaches are not available. Our teacher employed a series of yogic postures to warm up the body, exhaust the legs, and generate tremors in the thighs, hips, and lower back. After an hour of work, our class went into a resting posture for about ten minutes, and when we were finished I noticed that many of my body pains were significantly reduced. The positive results have been sustained for over a week. The effectiveness of Dr. Berceli’s TRE technique can be explained in purely physiological terms. Author Robert Sapolsky wrote a fascinating book called Why Zebras Don’t Get Ulcers, which covers the benefits of releasing trauma through physical movement. Research scientists have discovered that wild animals who encounter ongoing life-threatening situations are skilled at dissipating the longterm impact of stress. Sapolsky believes that human beings could benefit from following the model of our fellow mammals. Zebras have to deal with the constant threat of being hunted. They are equipped with a fight or flight mechanism, similar to humans, that enable them to react swiftly to the presence of predators. If they survive the chase, zebras will go into a recovery phase where they stabilize their adrenaline levels and give their muscles a rest. Their bodies will go through a stage of shivering and trembling, dislodging tension that would otherwise be stored in the body. In this way they overcome and dissipate the stress, so that they can go on with their day. Human beings are encoded with a similar self-soothing tremor mechanism, but few people know how to access it. Children do it naturally, but mounting social pressures during early development contributes to an impression that traumatic release is a sign of weakness. Children learn to abort the very process by which their bodies are attempting to discharge stress and maintain strength. As adults, this self-conscious resistance to traumatic release can become a major impediment to our healing. The desire to appear normal is sometimes so entrenched that we will not allow ourselves to cry or shake, even in the privacy of our own homes. Many people seek solutions from the pharmaceutical industry when the “medicine” is readily available within our own body. Kinetic vibrations generated by TRE are usually followed by a deep sense of peace and relaxation. Mental and physical stress levels drop significantly. 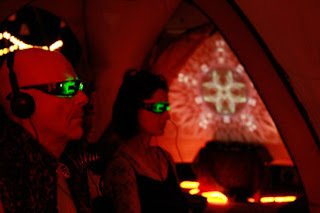 In my experience, the stress relief was accompanied by a subtle play of geometric light patterns, similar to what one might associate with high doses of psychotropic drugs, but without any of the disorienting effects. The medical term psycho-somatic, meaning mind-body, is often used in a derogatory way to suggest an “unreal” physical effect caused by a mental process. Viewed in a more neutral way, psycho-somatic effects could imply any kind of dynamic interface between the mind and body, including positive sensations. During the TRE session, I became aware of a play on the word psycho-somatic, which would integrate my experience of geometric light during the kinetic release. This new word was psycho-cymatic. Scientists have outlined a field of study called cymatics, from the Greek root cyma-meaning wave, implying a study of wave forms. Research has shown that sound vibrations have a direct impact on the organization of physical matter. Perhaps you have seen videos where sand has been scattered across a vibrating surface; a single tone frequency is directed toward the center of the plate, causing the materials to spontaneously self-organize into beautiful geometric shapes. As the pitch climbs up in register, it reaches key demarcation points where the previous geometric arrangement temporarily dematerializes and then reconfigures in a more intricate and complex shape. Cymatic geometry is not limited to experiments with small particles on a vibrating surface. It occurs everywhere in nature and is intrinsic to the fundamental laws of acoustics. Whenever a sound is created in nature, it projects through space in longitudinal compression waves. Oftentimes these waves are omnidirectional; the vibrating string of a cello or snapping of one’s fingers produces a spherical bubble of sound. In the past couple decades, three-dimensional photo imaging technology has allowed us to cut these sound waves in half. One company, called Cymascope, has published a large quantity of free photos and videos illustrating this concept. Their focus is on the movement of sound through water. 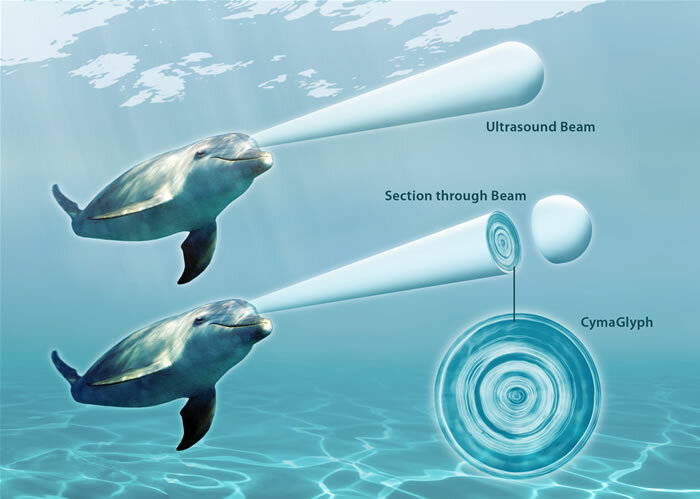 Cymascope has shown that dolphins communicate with one another using what I would like to call a hydrogeometric light language. The sound bubbles created by their speech are sonoluminescent; when these bubbles reach the water’s surface and pop, a small quantity of photons (light wave-particles) escape into the air above. Scientists have measured and proven the existence of these photon emissions. Cymascope photographs these light-sound bubbles and creates digital images that reveal geometric shapes closely related to the cymatic patterns generated by sand on vibrating surfaces. The Greek words cyma (wave) and soma (body) also relate to sema, a Greek word with two meanings; tomb and sign/symbol. The use of the word sema as tomb originates with the placement of Alexander the Great’s soma (body) in his casket. An interesting composite meaning emerges when these three words – sema soma cyma – are strung together. As already mentioned, dolphins appear to communicate with one another using a semantic vocabulary of cymatic wave forms. Neuroscientist and clinical psychotherapist John C. Lily bridged the science of cymatics and semantics with his invention of sensory deprivation chambers. These water-tombs are also called floatation tanks. Lily would fill his tanks with saltwater and enter them horizontally, allowing his body to float and experience weightlessness. During these floating sessions, his body was completely cut off from light and sound stimulus. Absence of light and sound in these water-tombs generated mental imagery and auditory hallucinations, which he wrote about extensively in his books and essays. Lily’s experimentation with internally generated light-and-sound hallucinations coincided with a mounting interest in dolphin communication. During the 1980’s he was the lead on a project that would attempt to teach dolphins a synthetic language. 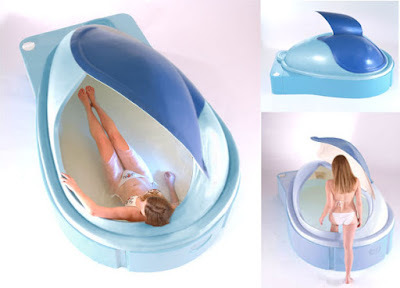 Floatation tanks have since become a staple of Western psychedelic/spiritual counter-culture, with float shops popping up all around the world. There may be a connection between Lily’s sensory deprivation research and his interest in Buddhism. During the mid 1970’s, Lily published a book called Simulations of God, in which he wrote a famous essay called God As Consciousness-Without-An-Object highlighting the Buddhist notion of sensory deprivation as a path to God. A variety of methods are employed to help the Buddhist aspirant empty their mind. One practice is called mantra, which involves the prayerful recitation of syllables combined with visualization of deities, followed by a period of silent meditation. During these silent periods, the mind is emptied and becomes a receptive vessel for transmissions from the deity. Monks use a mala, or prayer bead necklace, to count the number of times they have repeated a mantra. In the Tibetan dialect, mala implies circularity, and it shares an etymological root with the word mandala. I have personally experienced deep states of meditation from chanting mantra in sensory deprivation tanks. Occasionally these float sessions led to the spontaneous emergence of mandalas in my mind’s eye. 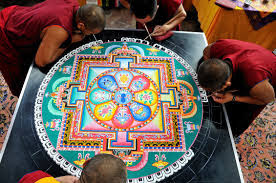 Tibetan monks practice the creation of highly intricate sand mandalas as part of their spiritual work. Colors and geometric elements of the mandala are selected to symbolize states of consciousness during the process of awakening. The mandalas are built, shared with the larger community, and then washed away with water to represent the impermanence of life. In this act, they conjure the death of body (sema-soma), the cymatic organization of psychic energy (cyma-mandala) and the creation of a meaning-rich symbol (sema) all at once. There appears to be a link between acoustic vibrations and the geometric organization of matter and light. Buddhist mantras generate cymatic visualizations in the mind’s eye, similar to the states attained during floatation tank meditations. These same acoustic-geometric patterns appear to be at the root of dolphin communication. Cymatic patterns are also generated by sand placed on a vibrating plate, which may be the secret reason that Buddhist mandalas are built from sand. All of this data points to an underlying principle of unified harmonic order. Sound frequencies traveling through air have an effect on human neurology and the human light body. Body tremors experienced during Traumatic Release Exercises seem to be kinesthetic manifestations of the same guiding principles that unify and animate wave forms on the sound and light spectrum. The trembling of our skeletal-muscular system generates inaudible sound waves. It stands to reason that the light body described in so many esoteric texts may be directly effected by the tremors, entering a state of symmetry which can be felt but not ordinarily seen with the eyes.A successful discharge of stress with TRE leads to deeper states of relaxation and lightness. As we learn to let go of our self-imposed limitations, our bodies come into balance and our true potential begins to shine. Conventional therapeutic techniques like cognitive behavioral therapy can be coupled with methods that address the body’s subtle energy systems directly. Elijah Parker of Onedoorland Stewdios in Portland, Oregon has created a beautiful collection of cymatic artwork under the pseudonym Subliminal Phoenix. The video at the beginning of this article comes from his collection. Elijah and I both have extensive experience working with Procyon Mind Machines, a technology that stimulates the auditory and visual cortex to produce a variety of different fluid mental states. These brainwave entrainment experiences have inspired both of us to create art inspired by the alchemy of tone and color. There are limitless possibilities and applications in the realm of psycho-cymatic healing. Some of them are based on sensory deprivation and others on sensory stimulation. Here is one more transmission from the psycho-cymatic dimension, brought to you by Subliminal Phoenix. Enjoy!